In the lead up to New Zealand Babywearing Week (Oct 10 – 16, 2011) we will be featuring the babywearing groups that run meetings in New Zealand. 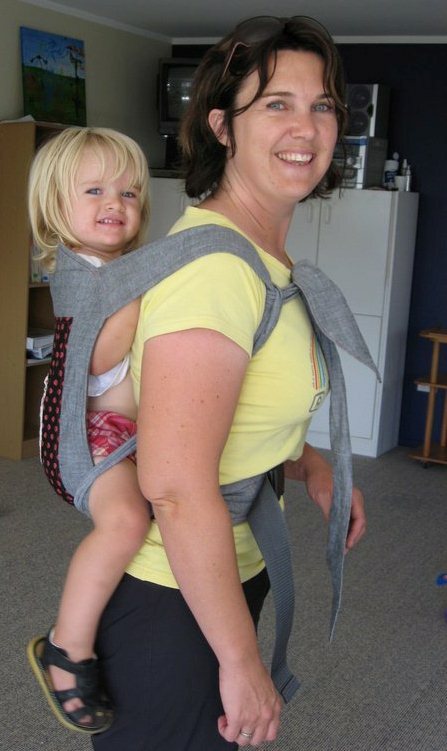 So far we have featured Slingbabies and Babywearing Wellington – this week we learn about Waikato Baby Carriers! When did Waikato Baby Carriers get started and why? Our first ever meeting was 3rd August 2010. 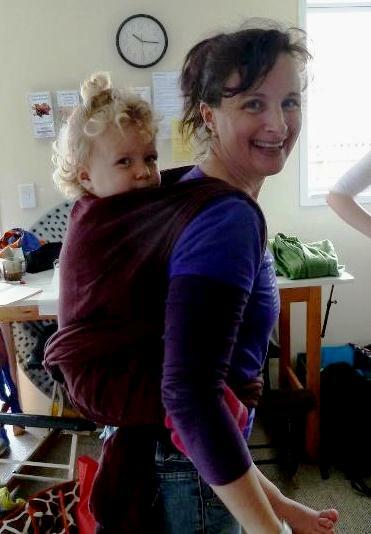 (Claire) We started WBC because we are passionate about babywearing and its many benefits. I used to get stopped by people who thought my baby looked snug and happy and wanted to know how/where/why etc. It’s cool to be able to do something you love so much with a dear friend and it means we get to spend time playing with gorgeous carriers while helping other Mums. It feels really good to be able to share the babywearing love. When and where are your meetings? We meet on theTHIRD THURSDAY of the month at Parent’s Place, 87 Boundary Rd, Hamilton. It’s the back room – go down the driveway and through the gate to get there. (Claire) Our meetings are very relaxed and people just come and go as they please. Some people come most months and some just when they need a hand. We welcome everyone with an interest in Babywearing whether they are looking to buy a carrier, learn to use the one they have or simply have a cup of tea with other Mums. We try to focus on safety and are largely guided by the wants and needs of the people at each meeting. One day we might do a back wrapping demo while other days there is a lot of interest in SSCs or trying a stretchy. Our aim is to meet people’s needs and by and large I think we manage that. (Kerry) Our meetings are pretty informal and people can come for advice or just to connect – though our focus is to help people with their babywearing needs and we want to make sure people go away with new knowledge and/or skills. people We will often do 2 or 3 different demos over the time period according to what people need to see as well as helping individual Mums with learning about new carriers or how to use their current carrier more comfortably. We love teaching people new tricks that make life so much easier. I’m pregnant but interested in Babywearing, can I still attend meetings? (Claire) We have a few Mum’s that we met when they were pregnant and they still come along now that their bubs are a bit older. One Mum that springs to mind has gone from using a stretchy to a ring sling to a Mei Tai and now she wants to learn to back carry. It has been awesome sharing her journey with her. When i bought my first wrap (a stretchy) I learnt to tie it well before bubs arrived so that i was confident tying it before i added the pressure of a tired/cranky/tiny baby so i think this is a great option. Are baby carriers available to hire from a lending library? If so, how does the lending library work? We do have a lending library which is a combination of carriers that have been donated and carriers we have bought ourselves – and many of our Mum’s have enjoyed taking home and trying an SSC, MT, RS etc. Lending is at our discretion and there is a nominal bond for the more expensive carriers. We also have a Tummy to Tummy DVD that is available for Mum’s to borrow. If each of you could share just one Babywearing tip, what would it be? This entry was posted in New Zealand Babywearing Groups and tagged baby carriers, baby slings, babywearing, babywearing in Hamilton, babywearing information, Waikato Baby Carriers. Bookmark the permalink.